When you think of animal achievers, it’s not often that you think of penguins. After all, dogs can work in stores and goats can mow the lawn, but what can penguins do besides waddle and be cute? Normally, I’d say nothing, but in Japan there’s a penguin that’s becoming a train conductor. Sure, it’s only for a day, but that’s pretty impressive for a flightless bird! Haruka the penguin is taking the helm of a round-trip train ride around Lake Shinji in Matsue. Haruka, from Matsue Vogel Park, is running the train with the cooperation of the Ichibata Electric Railway Company, which apparently has never met a gimmick it didn’t like. 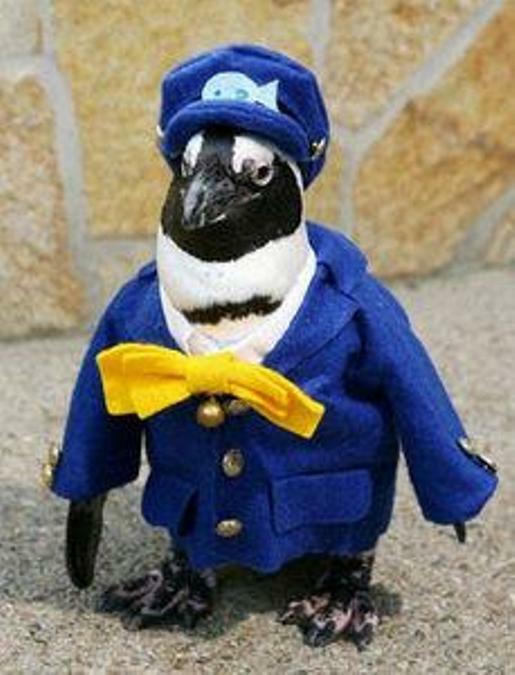 Before you ask, yes, the penguin will be wearing that adorable conductor’s outfit rather than the standard penguin wetsuit/tuxedo. “I hope the special train will be packed with many passengers, enough to make our penguin conductor work hard,” said an Ichibata official. It’s his first day on the job, man! Cut him some slack!